Rezaul Hossain is an innovative and visionary corporate leader, having extensive exposure in successfully transforming Bangladeshi consumer from “Wireless” to “Cashless”. He has more than 24 years of work experiences in Sales, Distribution, Marketing, International Roaming, Logistics, Project management and Product development in ICT, Telecommunication and Digital money industries. In his role as the Chief Commercial Officer (CCO) of bKash, where “IFC” and “Gates Foundation” have stake, has guided the company to drive revenue and customer acquisition in a complaint manner. His decisive leadership helped bKash to acquire over 22 million customers within five years, making it the “World’s largest mobile financial service provider” in terms of number of subscriber & agents. Previously he has served in Grameenphone (a Telenor Venture), Airtel Bangladesh (Bharti Airtel venture) and Citycell in Bangladesh at various leadership capacities. Reza is the founder Managing Director & CEO of “Celero” that aimed to be a platform for socio-economic development and enriching lives in Bangladesh. His latest initiative “Nagad” has been launched in the market recently with a vision of becoming the 1st ever full-fledged MAFS of Bangladesh. More than 5 Billion people and business, and at least 20 billion devices by 2020 will be connected through digital technology. With people, businesses and devices communicating, transacting and trading with each other, a new world comes into being- the digital business sphere, where digital financial service will play a vital role. Digital Financial Service promises rapid development of new capabilities that will give competitive advantage. One of those advantages will be integration of many low and middle income individual and SME into financial inclusion domain. Digitization of transaction, purchase, business and financial products is expected to expedite financial inclusion. In developing countries, most people and small business are not fully integrated into the formal financial system. They rely on cash for all their transaction, do not have feasible tool for investing and cannot access formal lending options. DFS can address this problem with one unique digital account (wallet) which will remove the current entry barrier, by facilitating transaction, payment, loan/financing as well as provide access to e-commerce and thus improve the quality of lives of millions of people. 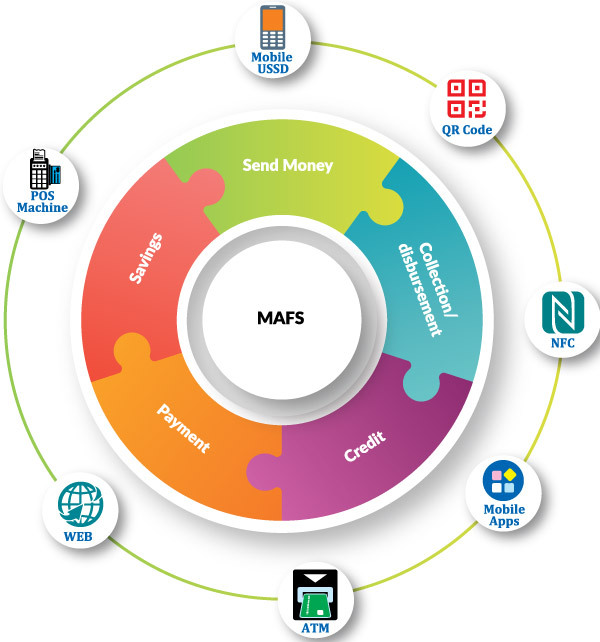 Over the years, Mobile Financial Services (MFS)/Multiple Access Financial Services (MAFS) has evolved from a simple money transaction channel to comprehensive financial solution platform and the journey has been fueled by both growing business needs and progress in technology. Services limited to few utility payment, top-up etc. Safaricom Kenya in 2017 launched M-PESA money transaction service through mobile USSD which was a Telco-led model with a support of Kenya government. It immediately became popular and dramatically increased people’s access to financial service, though its S&D structure was not full proof. M-PESA drove customers use of mobile phones to send and receive money, pay merchant and utility bills, as an alternative to the traditional banking system. One of the key reasons of M-PESA’s success was cultural, that many Kenyans used to work in metro areas leaving their families in villages. M-PESA campaign “Send money home” got huge response among those working class people, which constitutes a major chunk of the population. With its sister service, M-Shwari, users now able to save money and take loans, all without the much dreaded waiting hours, charges, vetting and paperwork like traditional banks. 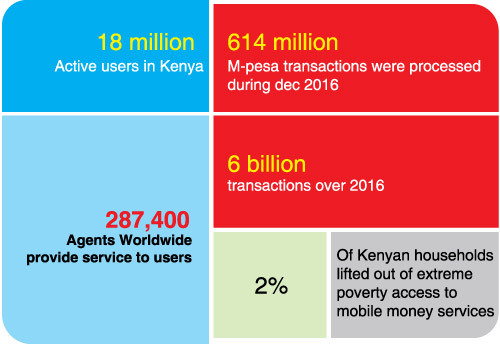 Due to M-PESA’s success, financial inclusion among Kenyans grew from 27% in 2006 to 75% in 2016. 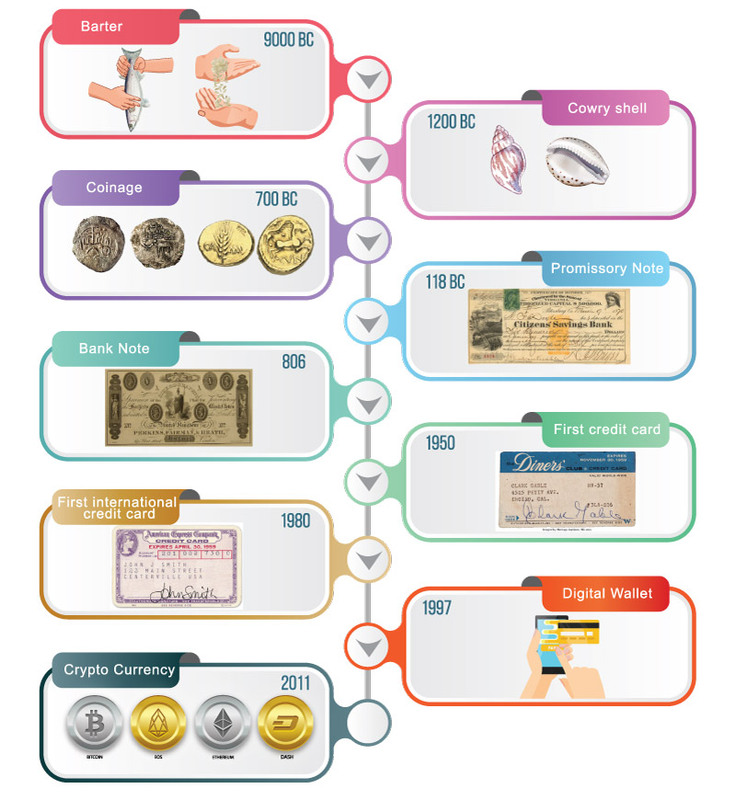 This becomes a successful model for mobile money throughout the world. M-PESA becomes part of the life of Kenyan people that now as a nation Kenyans are proud of three things: Runner, Big five and M-Pesa. Today there are 30 million users in 10 countries and a range of services including international transfers, loans, and health provision. The system processed around 6 billion transactions in 2016. In the same time some other players launched payment and money transfer through other access channels such as mobile apps, QR code etc. Paytm in India is a good example on that. Paytm is a Reserve Bank of India (RBI)-approved e-wallet. Users can simply pay by either scanning a QR code of the shop or by entering the mobile number of the recipient. As of end of 2018, 280 million people are now using Paytm to pay for their daily utilities and other expenses. Paytm invested an amount of 500 Crore Indian rupees to promote the brand through the campaign “Paytm Karo”. India government’s decision of demonetization worked as a catalyst for the popularity of Paytm. Demonetization forced people to switch to either plastic money or a digital payment method. This helped Paytm to further consolidate their position in the domain of e-payment application. One of interesting point as per the licensing guideline of the Reserve Bank of India, cash in or cash out is not allowed from Paytm or any such digital money service. Chinese players: WeChat and Alipay introduced more advanced feature such as chat pay. Money transfer through messaging apps as well as in-app purchase from ecommerce/marketplace is such a thing which has opened up another window for the digital revolution. WeChat, an initiative of Tencent holding, started its journey in 2010 as a messaging app. Since then, it has grown into the most popular mobile app in the country with over 1 billion monthly active users who chat, play games, shop, read news, pay for meals and post their thoughts and pictures. Through its multiple innovative services this app has converted Tencent Holdings, into one of the most influential companies in China and grabbing the attention of global investors. To understand the WeChat universe, it is important to take a look at its underlying product philosophy. It’s all about one word – ‘connect’. WeChat wants to connect to everything, it wants to plug into the user’s life, whenever and wherever possible. Alipay is a part of Ant Financial’s ecosystem of financial services, a initiative of the Chinese e-commerce giant Alibaba Group. In 2004, Alibaba Group launched Alipay to support online payment on Alibaba.com and Taobao.com. Alipay quickly become the leading online payments service provider in China, claiming more than 50% market share and 47M users by 2007, according to Alibaba Group. Alipay not only allows mobile based financial transaction and payment but also has expanded its scope into credit scoring, wealth management, insurance, and lending. With its associated companies, Alipay has 600 million users, which has made it’s the largest fintech player globally. 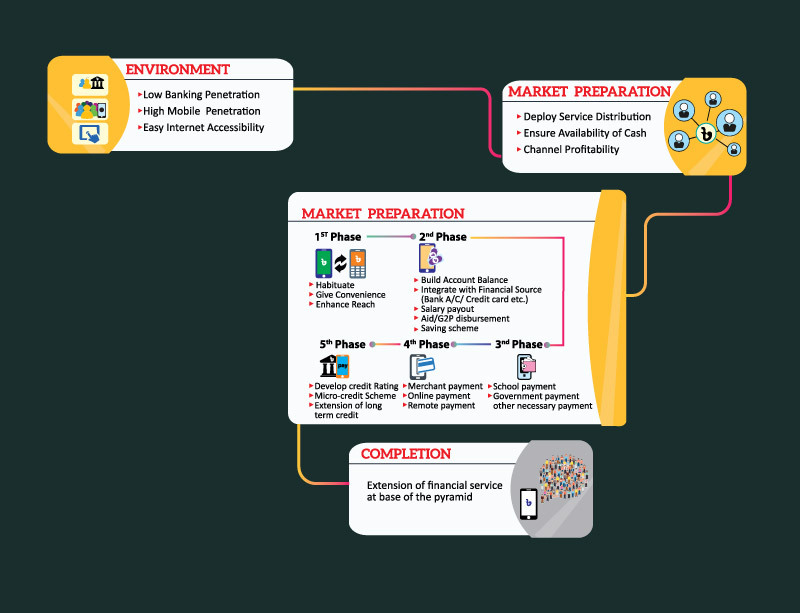 To drive financial inclusion, Bangladesh bank issued a draft guideline in 2011 and permitted 28 Banks to offer Mobile Financial in bank led model. 18 banks have already launched mobile financial services up to June, 2017. But Except bKash, none of the entities are yet to become successful. Even Dutch-Bangla Bank Limited (DBBL) which made significant effort following the Bangladesh Bank guideline; couldn’t achieve significant business volume, because the guideline was not right, initially. Among different services, send money, cash in and cash out constitutes the major chunk of the pie. Through an unique business model, robust distribution network, efficient cash management and aggressive customer acquisition drive, bKash became the “World’s largest mobile financial service provider” in terms of number of subscribers and number of agents within 5 years of launch. bKash also had unique company structure which worked as an accelerator for growth. 2 billion out of the world’s 7 billion do not have access to financial services. 1/3 of the global population 1 billion are in Asia. Bangladesh has already achieved 37% financial inclusion by 2018 compared to 16% in 2011. Low cost, easy accessibility and convenience of MFS has vastly contributed to the financial inclusion of the country’s “unbanked population” – reaching places & people far better than banks. Ownership/access over a mobile handset is the 1st step for getting access in the digital financial services. The device might be a simple bar phone, feature phone or smart phone. As per the BTRC data, there are 156 million mobile subscribers, whereas there total number of handset is 121 million. So, this is clear that: there are 35.5 million pocket sim (Sim without device). Majority of the users at 1st purchase a bar phone or a feature phone, at price range: BDT 650- 2,000, based on his/her financial condition. Major usage is voice call, SMS and few VAS, few multimedia content etc. After using the device from 12 months- 24 months, they switch to entry level smart phone of range: BDT 3,000- 5,000- mostly local brand and Chinese brands. Users started internet and VAS contents, multimedia contents etc. The regulatory framework can play a vital role by facilitating the MAFS players in terms of customer acquisition through easy A/C signup process. Efficient cash management is a must for successful MAFS/MFS rollout; the regulator can support this by allowing multi bank fund management facility. Regulator can promote account integration for better mobilization of fund between traditional bank accounts and MAFS/MFS accounts. For business sustainability of the players, proper Tax & VAT structure is required from the regulatory body. For providing easy and convenient access to mass people, significant telecom penetration is a pre-requisite. Justified revenue sharing with access channel partners (MNO) is required to maintain healthy business. Proper data coverage through MNO/ wireless broadband service providers is required to increase adoption of advanced access channel like: Apps, QR code etc. Nationwide banking coverage is required to support distributors in proper market service. Law & Order Situation of the country impacts the market service and overall business viability. Availability of adequate cash in bank branches is required along with vault limit and extra hour support to distributors. Flexible & Scalable system is required to facilitate millions of people to do transaction, payment and other things within a shortest lead time. 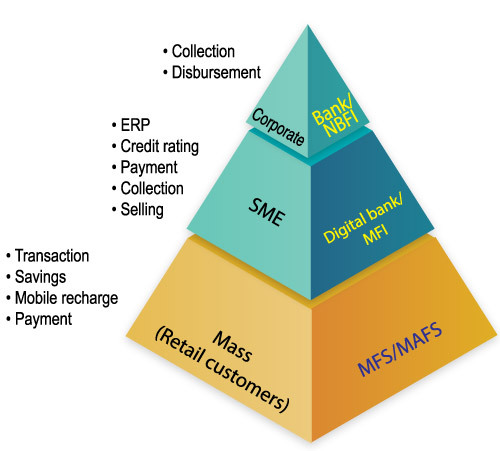 A user friendly interface is required to convince people for utilizing the MFS/MAFS for their daily financial needs. Other payments like microfinance, overdrawn facility, insurance premium, DPS, etc. 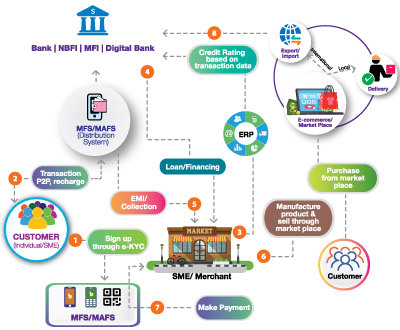 MFS has facilitated million of masses with easy access to formal financial system, which is not feasible for traditional banking channel. MFS has helped in faster disbursement of donor agencies fund and also helped in establishing transparency in government disbursement. Due to increased popularity and wide acceptance of the MFS, conventional banks are losing retail business. Formalization of fund due to financial inclusion is resulting higher revenue for government which actually contributing in GDP growth of the country. It will be tough for the traditional banks to survive in future, as they are dependent on Interest income & Service charge as the primary source of income. Greater access to local and international market through e-commerce, export/import etc. New streams of granular, real-time data are emerging, and enterprises can use that data to support business decision-making. 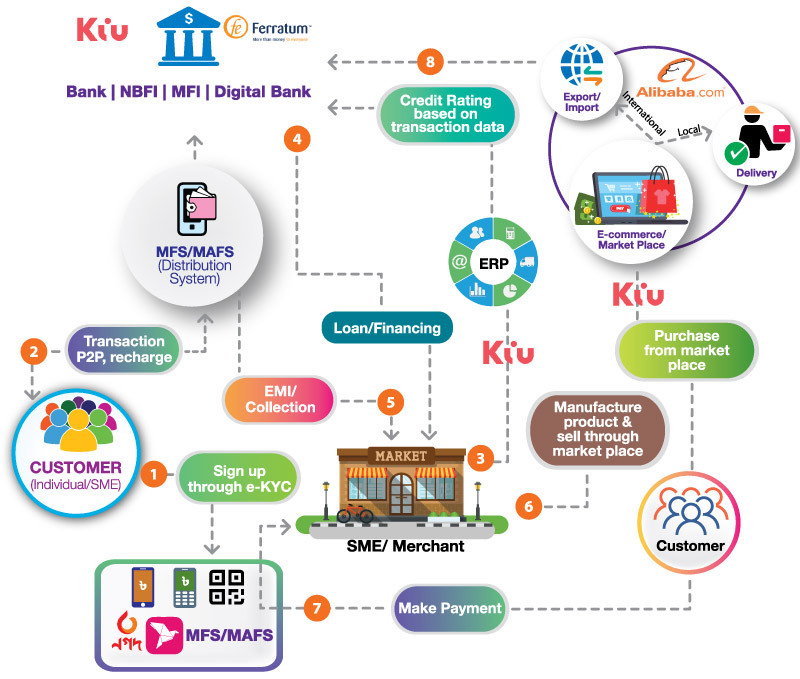 Alternative funding platforms & Marketplace lenders (like Kiu, Ferratum) are widening access to financing activities and providing fund to a greater number of small and medium enterprises through DFS platform.